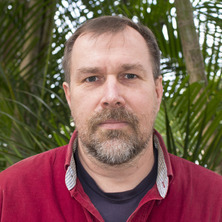 Dr Timo Nieminen received his PhD from The University of Queensland in 1996. Optical forces and torques acting on a microparticle in a laser trap arise from the transfer of momentum and angular momentum from the trapping beam to the particle, and can be found by calculating the scattering of the trapping beam by the particle. Since laser-trapped particles are of sizes comparable to the trapping wavelength, a full electromagnetic wave solution is required. An alternative to the calculation of the scattering by a laser-trapped particle is to measure the scattered light, and from this, determine the optical force and torque acting on, and the position within the trap, of the particle. Extremely asymmetrical scattering is being investigated theoretically and computationally in collaboration with the Physical Optics Program, School of Physical and Chemical Sciences, Queensland University of Technology. Theoretical development of MOMS and MOMS-related techniques. Dynamics of constrained Brownian motion of neuro-secretory vesicles. Choi S.H.-J. and Nieminen T.A. (2010). Trained peers' interactions with children with autism during play. In Special Education in the 21st Century (pp. 195-224) : Nova Science Publishers, Inc..
Favre-Bulle, I. A., Zhang, S., Kashchuk, A. V., Lenton, I. C.D., Gibson, L. J., Stilgoe, A. B., Nieminen, T. A. and Rubinsztein-Dunlop, H. (2018) Optical tweezers bring micromachines to biology. Optics and Photonics News, 29 4: 40-47. Choi,Serene Hyun-Jin, Nieminen, Timo A., Maucort, G., Gong, Y. X., Bartylla, C. and Persson, M. (2013) International physics research internships in an Australian university. Australian Universities' Review, 55 1: 36-43. Choi, Minjoon, Choi, Serene and Nieminen, Timo (2004) Autistic Students' Ensemble. snapshots: primary, 1 2: 31-32. Gramotnev, D. K., Mather, M. L. and Nieminen, T. A. (1998) Anomalous absorption of bulk longitudinal acoustic waves in a layered structure with viscous fluid. Proceedings of the IEEE Ultrasonics Symposium, 2 1203-1206. Rubinsztein-Dunlop, Halina, Asavei, Theodor, Parkin, Simon, Stilgoe, Alex, Loke, Vince, Nieminen, Timo and Heckenberg, Norman (2009). Can Optically Driven Micromachines be Useful in Biomedicine? Optical Tweezers at Work. In: Asia Optical Fiber Communication and Optoelectronic Exposition and Conference, Shanghai Peoples R China, (). Oct 30-Nov 02, 2008. Choi, S., Nieminen, T.A. and Manathunga, C. (2008). "What Brought you Here?" International Postgraduate Students' Perspectives. In: 5th International Lifelong Learning Conference. 5th International Lifelong Learning Conference, Rydges Capricorn Resort, Yeppoon, Qld, (96-99). 16-19 June 2008. Hu, Y., Nieminen, T.A., Bickford, L.R. and Drezek, R.A. (2008). Concentric Sphere Mie Theory Model: Applications to Nanoshell Spectra Prediction and Design of Anti-Reflection Coatings for Optical Traps. In: Biomedical Optics (BIOMED). Spring Optics and Photonics Congress, St Petersburg, Florida, USA, (1-3). 16-20 March 2008. Choi, S., Nieminen, T.A. and Manathunga, C. (2008). Postdoctoral and Early Career Research Work for Further Learning and Independence. In: 5th International Lifelong Learning Conference. 5th International Lifelong Learning Conference, Rydges Capricorn Resort, Yeppoon, Qld, (91-95). 16-19 June 2008. Choi, S., Nieminen, T.A., Bartylla, C., Bertrand, D., Gong, Y.X., Huber, E., Kruger, K. and Therkildsen, K. (2007). Research training experiences of visiting students in physics. In: Sanderson, G., Conference Proceedings of the 18th ISANA International Education Conference. 18th ISANA International Education Association Conference, Glenelg, South Australia, (1-7). 27-30 November, 2007. Nieminen, T. A., Loke, V. L. Y., Knoner, G. and Branczyk, A. M. (2007). Toolbox for calculation of optical forces and torques. In: Kong, JA, Piers 2007 Beijing: Progress in Electromagnetics Research Symposium, Pts I and II, Proceedings. Progress in Electromagnetics Research Symposium (PIERS 2007), Beijing Peoples R China, (721-725). Mar 26-30, 2007. Hajek, K. M. and Nieminen, T. A. (2006). Aether theories: A physics fairytale re-told. In: Robert Sang and John Dobson, Proceedings of: Australian Institute of Physics (AIP) 17th National Congress. Australian Institute of Physics (AIP) 17th National Congress, Brisbane Convention and Exhibition Centre, Queensland, Australia, (1-4). 3-8 December 2006. Nieminen, T A (2006). Project-based assessment for graduate coursework in physics. In: Dr Robert Sang and Professor John Dobson, Australian Institute of Physics (AIP) 17th National Congress 2006. Australian Institute of Physics (AIP), Brisbane Convention and Exhibition Centre Queensland, Australia, (1-4). 3-8 December 2006. Choi, Serene H.-J. and Nieminen, T. A. (2005). Effect of Participation as Peer-Players on Ideas and Attitudes About Disability. In: F. Bryer, Proceedings of the 30th Annual Conference of the Australian Association of Special Education. Making Meaning: Creating Connections that Value Diversity, Brisbane, Australia, (38-45). 23-25 September 2005. Choi, Serene H.-J. and Nieminen, Timo A. (2005). Improved Social Interaction by Children With Autism by Training of Peers. In: Bryer, Fiona, Proceedings of the 30th Annual Conference of the Australian Association of Special Education. Making Meaning: Creating Connections that Value Diversity - Proceedings of the 30th Annual Conference of the Australian Association of Special Education, Brisbane, Australia, (46-53). 23-25th September, 2005. Choi, Minjoon, Choi, Serene Hyun-Jin and Nieminen, Timo A. (2004). Case studies of music students with autistic spectrum disorders. In: Proceedings of: 2004 Hawaii International Conference on Education. 2004 Hawaii International Conference on Education, Honolulu, Hawaii, (748-756). 3-6 January 2004. Choi, Serene Hyun-Jin, Nieminen, Timo A., Bahr, Mark and Bahr, Nan (2002). Improving behaviour classification consistency: A technique from biological taxonomy. In: P. L. Jeffery, Problematic Futures: Educational Research in an Era of ... Uncertainty. Australian Association for Research in Education Annual Conference 2002 (AARE2002), Brisbane, Australia, (). 1-5 December, 2002. Nieminen, TA, Rubinsztein-Dunlop, H and Heckenberg, NR (2001). Trapping and alignment of a microfibre using the discrete dipole approximation. In: Cleo(r)/pacific Rim 2001, Vol Ii, Technical Digest. 4th Pacific Rim Conference on Lasers and Electro-Optics, Chiba Japan, (138-139). Jul 15-19, 2001. Nieminen, T. A. (2000). Grazing-angle scattering of blk and guided electromagnetic waves in non-uniform arrays. In: 14th National Congress of the Australian Institute of Physics. AIP 2000, Adelaide University, (28-28). 10-15 Dec, 2000. Nieminen, TA and Gramotnev, DK (2000). Rigorous analysis of extremely asymmetrical scattering of electromagnetic waves in periodic gratings. In: Integrated Photonics Research, Technical Digest. Conference on Integrated Photonics Research, Quebec City Canada, (192-194). Jul 12-15, 2000. Gramotnev, DK, Mather, ML and Nieminen, TA (1998). Anomalous absorption of bulk longitudinal acoustic waves in a layered structure with viscous fluid. In: Schneider, SC, Levy, M and McAvoy, BR, 1998 Ieee Ultrasonics Symposium - Proceedings, Vols 1 and 2. 1998 IEEE Ultrasonics Symposium, Sendai Japan, (1203-1206). Oct 05-08, 1998. Friese M.E.J., Nieminen T.A., Rubinsztein-Dunlop H. and Heckenberg N.R. (1997). Angular momentum transfer from a circularly polarized Gaussian laser beam. In: Proceedings of the 1997 Conference on Quantum Electronics and Laser Science, QELS, Baltimore, MD, USA, (108-109). May 18, 1997-May 23, 1997. Nieminen, Timo A. and Pfeifer, Robert N. C. (2006) Visualisation of Cherenkov Radiation and the Fields of a Moving Charge. Nieminen, Timo A. (1996). Solar Line Asymmetries: Modelling The Effect Of Granulation On The Solar Spectrum PhD Thesis, Department of Physics, The University of Queensland. Light scattering in complex mesoscale systems.